Here is our advent calendar for this year. I have tons and tons of sweaters that I've felted, and stashed away in our attic. I figured it was high time I actually did something with them, as Jay is always grumbling that I have too much stuff up there (he's very concerned about the orderliness on the attic!) 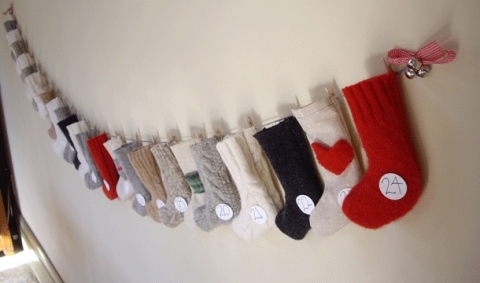 So, I made some wee stockings and strung them up with mini clothespins. I debated embroidering numbers on each one, and figured that that can wait until next year, so I chintzed out and used stickers. Then we just peel them off when the day is done. 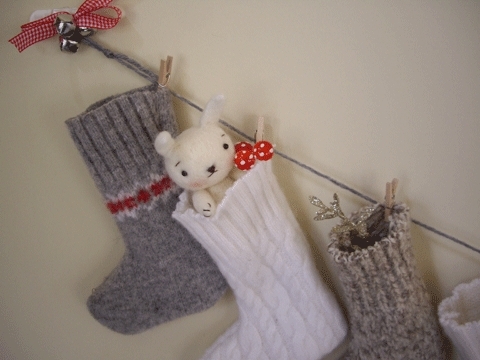 There is a little bunny to hop to each day, and each stocking has a little activity in it. Although Clara has yet to care about either activity, today or yesterday. I may have to think of some better ones! I love it. It looks great. I always mean to make an advent calendar and then something else gets in the way. How cool is this? I have a stash of wool sweaters I want to felt…so I would like to ask you a question: Do you cut them up before or after you wash them? Hi! Thanks! You should definitely felt those sweaters! You would want to felt them in the washing machine, then cut them, that way they dont unravel, and you get a nice clean edge. SOOOOOO cute Jenn! One of the absolute sweetest advent calenders I’ve seen. Thanks for showing us! Great use of the sweaters! I love it. Happy to have just found your blog. wow! love the idea! how special.. Clara will someday look back with wonderful memories! This is so cute! I’m linking it to my Friday dance! Any chance you’d post the template for the wee stockings? I have a bunch of felted items just begging to be used for this project! Thanks! I used this template for my stockings: http://www.marthastewart.com/article/mini-stockings, although I sewed them right sides together, and turned them rightside out. You should definitely make one! So cute! I love this idea for an advent calendar. I love your blog too. I have been reading it for about 5 months and am writing for the first time today. Lovely stuff! Keep it up.